A local government subverts democracy by handing out large portions of a public school system to private operators. A government joins forces with big corporations to evict large numbers of low-income farmers from their land to make way for mining and manufacturing operations. An international agency compels a government to privatize water delivery in major cities, benefiting a major multinational corporation. What is striking about each of these stories is that they have repeated themselves in different cities, countries, even continents. The first story is true of Washington, DC. It is also true of New Orleans, or Dayton, Ohio. The second story is true of India. It is also true of Guatemala and Honduras. The third story could equally well be set in Ghana, Tanzania, Bolivia, Argentina, or the Philippines. Minus the role of the international agency, it could also have been New Orleans, Atlanta, or Stockton, California. At its core, neoliberalism is a belief in the supremacy of private capital, and the private profit motive, over all else. (In that sense, neoliberalism is a particularly rigid form of what we otherwise know as free-market capitalism.) In neoliberal ideology, capital and its priorities take precedence over human needs, over collective aspirations of peoples, over any value system that values anything for any reason other than its potential to generate a profit. Ultimately, neoliberalism is the political ideology of the anti-political, which seeks to depoliticize public spaces and public discourse by claiming, first, that it is not an ideology, and that decisions flowing from neoliberal ideology are driven instead by rational choice; and second, that the choices dictated by neoliberalism are the only possible rational choices. Neoliberalism reduces political questions to technocratic questions. Margaret Thatcher summed up this totalizing and anti-political bent of neoliberalism best in her famous statement that “There is no alternative” to unrestrained free-market capitalism. As we saw from the examples in the first paragraph, the manifestations of neoliberalism do not by any means occur only in the formerly colonized nations of Africa, Asia, or Latin America that are collectively called the “Global South.” The very same mix of privatization, deregulation, “supply side” fiscal and monetary policies, and infrastructure development in the interest of capital (and to the detriment of the poor majority) is replicated in much of the wealthy North, from a national to a local level. The Bush administration’s tax cuts and anti-labor policies are straight from the playbook of an International Monetary Fund-imposed structural adjustment program, and it makes little difference to those harmed by these policies whether the IMF was involved or not! In cities across North America, public school systems are being systematically replaced with privately operated (sometimes even for-profit) charter schools, unaccountable to the public but nevertheless subsidized with public funds. This process is fundamentally the same as the privatization of water, electricity, and other public utilities across the Global South at the behest of the World Bank and its regional counterparts. In neoliberal ideology, public infrastructure created with public resources is treated as another frontier to extend the reach of the market. This racialization of poverty in North America is of course not uniquely North American either; it is a regional manifestation of a global phenomenon of racialized inequalities of wealth and power, a phenomenon that has been termed “global apartheid”. Global apartheid is a very useful framework through which to view the commonalities of neoliberalism and its consequences in both the South and the North. The fact that the Global South consists mainly of Africa, Latin America and large parts of Asia is not a coincidence but a consequence of the racialization of global wealth and power – which in turn is a consequence of the continuing legacy of colonialism. The identities of the beneficiaries of neoliberalism also have much in common in the North and the South. Capital is globalized and consolidated to the extent that in most industries, the dominant players worldwide are a relatively small number of multinational corporations. The real estate, retail, and hotel corporations benefiting from gentrification of U.S. cities are multinational corporations, often with interests in the Global South. The private water corporations taking over water systems throughout the Global South are the very same corporations attempting to take over water utilities in the U.S. Major U.S. banks currently embroiled in the mortgage lending crisis are also multinational corporations, and holders of sovereign debt of Global South countries. Many of these same banks have been involved in global financial crises such as East and Southeast Asia in 1998 and Argentina in 2001. With the same underlying ideology driving the global assault on people’s lives, and so much in common between the identities of affected persons and the identities of beneficiaries, the potential for building a cross-border, cross-issue movement of global solidarity against global capital is immense. To a large extent such a global movement is already taking shape, with the gathering of worldwide movements at the World Social Forum being just one example. To a significant extent, however, grassroots social movements in the U.S. are isolated from global movements. (There are some truly inspiring exceptions.) Conversely, in the U.S. (as in other Northern countries), there are organizations and movements acting in solidarity with people’s struggles worldwide, such as the Latin America solidarity movement or the small, relatively new (in the U.S. context) “global justice” movement, which fights against global financial institutions and trade agreements, but these movements are often isolated from any real grassroots community base. The major themes of this article are to explore reasons why this relative isolation of local struggles from international struggles occurs in the U.S., examine case studies of local-global connections that have been formed successfully by social movements in the U.S., and attempt to understand what worked for these movements as well as what impediments they faced in putting their work in a global context – or conversely, building local roots for their global solidarity work. It is important to state at the outset that the relative lack of local-global connection in U.S social movements, while a weakness, should not by any means imply that U.S. movements lack the vision or capacity for forming such connections. Speaking from personal experience as an organizer who has attempted to build such connections, there are good reasons why such connections are very hard to build and sustain in meaningful ways beyond mere gestures of verbal solidarity – reasons which will hopefully emerge in the following discussion. For reasons that are too complex to analyze in this space, the U.S. is a particularly difficult terrain on which to build social movements in general. When it comes to building a local struggle in the U.S. that is truly aware of its global context, or a global solidarity struggle that genuinely connects with local struggles, the difficulties are compounded. Participants in international solidarity movements in the U.S are often from a relatively privileged background, for the simple reason that (with exceptions of course) one needs to be fairly privileged to have the luxury to focus one’s activist energies entirely on solidarity with a population halfway across the world rather than the survival of one’s own community. This statement is not by any means intended as a criticism – given the aggression of U.S. foreign military as well as economic policy, the world needs a U.S.-based global solidarity movement to resist this foreign policy in its home country. And U.S-based solidarity movements have played an important role in global struggles, such as the struggle to dismantle apartheid in South Africa. (The exception to the phenomenon of relative privilege of international solidarity activists often consists of immigrant communities, including low income people, acting in solidarity with movements in their home countries.) This privileged background can sometimes act as an impediment to global solidarity activists seeing the impact of neoliberalism in their own backyard, even when they see it very clearly in Bolivia, Benin, or Bangladesh. Even when U.S.-based international solidarity activists can theoretically grasp the impacts of neoliberalism in the U.S., translating this understanding into concrete action entails overcoming another layer of difficulty. Sometimes, the institutions one confronts in one’s global work have no direct impacts on the local community, and no local counterpart. Nevertheless, creative ways can be found to integrate global work with local solidarity in ways that are meaningful, as one of the case studies discussed below shows. Conversely, local struggles for housing, health care, education, and low income workers’ rights in the U.S do not always have the easiest time contextualizing their work globally either. The analysis of the assault on low income and working people in the U.S as being a product of neoliberalism and as being fundamentally connected to similar phenomena elsewhere is relatively new and not widespread. However, as two of the case studies show, the integration of locally-based struggles in the U.S. with the global context has also been done with considerable success. A key struggle in the United States today, in terms of the urgency of action, the viciousness of the right-wing backlash against it, the popularity and level of participation, and most of all the maturity and depth of analysis informing the movement, is the immigrants’ rights struggle. A movement that unapologetically demands full human rights for all immigrants regardless of their documentation status has been forming and growing for years, but it burst onto the national scene with unprecedented strength and captured the public imagination in the months of March through May of 2006. Unlike many other struggles in the U.S., the immigrants’ rights struggle is by its very nature international. Undocumented immigrants are a population of international origin who have experienced the ravages of neoliberalism in their home countries in the Global South, which is what in most cases compelled them to migrate in the first place. In the words of Maria Elena Letona, director of Centro Presente, an organization of the Latino immigrant community in Massachusetts fighting for the rights of the community as immigrants and as workers, “migration flows in the 21st century [are] a direct result of corporate globalization.” She points out that the displacement of people in the Global South because of neoliberal policies has been “quite radical”; for example, in Mexico, about 2 million small farmers have been displaced. Here in the U.S., immigrants face the impacts of neoliberalism as exploited workers living in low income communities. Often the corporations exploiting their labor are the very same multinational corporations who are pillaging the Global South. Immigrants also experience the coercive power of the state in the form of ICE raids, detention and deportation. Very importantly, immigrants in the U.S. are “are still very connected to their families, communities and native countries,” as Letona puts it. The sum total of immigrants’ experience inevitably creates an internationalist perspective. An example of internationalism in the U.S. immigrants’ rights movement is Centro Presente’s work as a founding member of two national networks, the Salvadoran-American Network and the National Alliance of Latin American and Caribbean Communities (NALACC). These networks have organized delegations to El Salvador, Guatemala, Honduras, Mexico, and other countries to network with NGOs there, to promote sustainable community-based development, and to lobby national government officials against free trade agreements and in favor of increased advocacy from the governments for the rights of migrant communities from their countries in the U.S.
Centro Presente, along with many other immigrants’ rights organizations from the U.S., have participated in the World Social Forum, the Social Forum of the Americas and the Social Forum on Migration. In 2007, NALACC organized the first ever Latino Hemispheric Summit on Migration in Michoacan, Mexico. The summit drew leaders of Latino immigrant communities from all over the Americas as well as from Spain and Italy. In the Washington, DC area, Mexicanos Sin Fronteras (MSF), a Mexican immigrant community organization fighting for the rights of the community, has been very active in standing in solidarity with the people’s strike and revolt in Oaxaca, Mexico. Recently, MSF has also organized an action protesting the Mexican governments’ treatment of Central American migrants. The process of gentrification in U.S. cities has been referred to earlier. While affected communities have been resisting it for decades, in recent years there have been two very positive developments. First, there is increasing coordination between organizations fighting gentrification in different cities across the country. Second, a number of these organizations have coalesced around a proactive agenda – articulating a “Right to the City.” Tired of being limited to fighting defensive actions to hold on to the limited, shrinking space that low-income communities can still live in and access in cities, the Right to the City alliance asserts that, “We all have the right to remain and return to our cities, to take back our streets and neighborhoods, and to ensure that they exist to serve people rather than capital.” The Right tot the City alliance came together in January 2007, and has grown to include more than 25 organizations. So far, in the less than one year and a half that the Right to the City alliance has been in existence, the spirit of internationalism of the alliance has manifested itself most concretely in the collaboration with urban poor people’s movements in Venezuela and the Philippines. Activists from these movements have participated in Right to the City workshops at the U.S. Social Forum, and subsequently, the alliance has provided solidarity for their struggles. Jon Liss of Tenants and Workers United, an alliance member organization working for access to housing, healthcare and democratic rights for the majority of people in Northern Virginia, attributes the emphasis on internationalism in the alliance’s principles to successive waves of immigration, which have resulted in urban working-class communities that have an “organic link with Global South.” Another reason for the internationalist focus, he says, is that “many communities and organizers have radical roots and see domestic issues and global empire as connected.” Further, he states that the internationalist focus is also self-interested. As an example, Liss holds the influx of Federal “anti-terrorism” funding into Northern Virginia post-September 11 as being to a large extent responsible for fueling the recent wave of gentrification there, by creating a boom of high-paying jobs in the security-industrial complex. This shows how U.S. international policy can have a concrete effect on communities’ access to housing. Liss sees clear benefits from internationalism for the Right to the City alliance, including learning from advanced struggles in the Global South, which, according to him, “have a high level of political consciousness, and sometimes a deeper analysis of the political economy of the United States than U.S. movements.” He gives the example of participatory budgeting in Brazil as a strategy for us in the U.S. to learn from Southern social movements. Liss cautions, however, that internationalism has its limitations, and U.S. social movements have to be “aware of the reality of our political base.” He says that there can be a tension between that reality and the demands of solidarity with international movements, as a result of which the international work can become a lower priority. The relatively privileged composition of the global justice movement in the U.S. has been referred to earlier. This is (as has also been stated earlier) not necessarily a criticism; it is partly inevitable that a movement focused on foreign policy issues would draw the participation of a demographic who have relatively less at stake in immediate local struggles. You can’t worry too much about AIDS in Malawi or toxic gold mining in Guatemala when your neighbor is getting evicted and you know you could be next. Conversely, you can worry more about these distant issues when you do not have to worry about where your next meal will come from or how to avoid getting deported. But regardless of the inevitably more privileged character of a global justice movement in the U.S., it is too important a struggle to dismiss. The world needs a global justice movement in the U.S., to resist neoliberal imperialism in its home base. Since the U.S. government and U.S. business interests are major driving forces behind the unjust global economy, it is imperative that people in the U.S. resist this agenda. Simply put, we owe this to the rest of the world. What is a concern, however, is that this relatively privileged composition of the movement can be a serious impediment to its effectiveness. One of the major limitations of the U.S. global justice movement has been its small size and lack of a solid base. The fact that the movement lasted as a powerful force for only about four years – from 1999 through 2003 – shows that it lacked sustainable organizing and base-building. By (largely) failing to connect the struggle against neoliberalism globally with the daily struggle against neoliberalism in communities across North America, the U.S. global justice movement has missed the opportunity to widen and deepen its base, and develop staying power as well as political power. There have been exceptions, however. Some global justice organizations have attempted with varying degrees of success to connect their work locally, and we look at one example, based on the author’s first-hand experience. The Mobilization for Global Justice (MGJ) in Washington, DC, has been around in various forms from late 1999 until the present. It started as an ad-hoc coalition to mobilize for the “A16” demonstrations at the IMF/World Bank annual meetings in April 2000, and has since then evolved into more of an organization than a coalition. Throughout its history, MGJ has made sporadic attempts to integrate its work with local struggles, but has not done so consistently until about 2005. This article examines about two years of MGJ’s activities (2005 through 2007) to identify successes as well as failures in the attempts to integrate local struggles against neoliberalism with its regular work around the IMF, World Bank, and global trade. 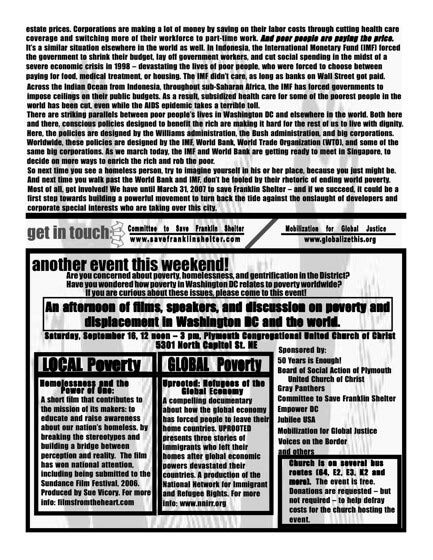 In February 2005, MGJ presented a workshop at the National Conference on Organized Resistance titled “Structurally Adjusting Washington DC”. It was at that time conceived of as a one-time popular education effort to frame the onslaught on communities in Washington, DC as the product of neoliberalism. Specifically, the workshop looked at the effective privatization of health care in the District (by closing the only public hospital), the publicly subsidized construction of a baseball stadium, and gentrification in city neighborhoods. The motivation for doing this workshop was a desire on the part of members of MGJ to begin to connect our work to local struggles. The interest in this workshop was overwhelming, and a number of the organizations participating in the workshop, including DC Jobs with Justice, the DC Health Care Coalition, Project South, and MGJ, decided to continue popular education work linking local to global struggles. This informal coalition put together another popular education teach-in in April 2005, in conjunction with protests planned for the meetings of the IMF and World Bank. What was particularly powerful about this teach-in was that it featured dialogue between visiting activists from the Dominican Republic, South Africa, and the Philippines, and local activists working for low-income tenants’ rights, access to affordable health care, access to education, and environmental justice in Washington, DC. The education was both ways – the author remembers vividly how one of the activists from the Global South came up to him after the event to say that she had no idea that neoliberalism was ravaging the capital of the United States to quite this extent, nor that there was such a vibrant movement here to resist the neoliberal onslaught. There is a key lesson to be learnt from the experience of the workshop and the teach-in; namely, that there is a tremendous amount of interest among local organizers in understanding and discussing the global context for their work. The U.S. global justice movement has not done nearly enough to tap into this interest. A clear understanding of neoliberalism and its global nature can help organizers working on local struggles to identify more strongly with the periodic protests against the IMF, World Bank, WTO, or other trade agreements as part of the same wider struggle, instead of treating them as not relevant to one’s own causes. This addresses a major problem faced by the U.S. global justice movement, the problem of relevance. To much of the public, the concerns of the global justice movement have appeared esoteric and bearing no relation to their daily lives, while in fact the concerns of the global justice movement are vital to the daily lives of people everywhere, including in the U.S. It is partly our own fault that we as a movement have not been able to communicate the relevance of the issues we work on in a compelling manner. Right after this teach-in, however, the local-global connection-building work of MGJ hit an impasse. Popular education is a great tool, but ultimately, it has to lead to action for it to serve a purpose. At first we could not collectively figure out an obvious way to translate our developing understanding of the local impacts of neoliberalism into a program of action that would seamlessly integrate our work on the global economy with our work on local struggles. After much deliberation, we settled on a course of action: reviving the Tax the Bank Campaign. Space does not permit a complete discussion of details, but the summary version of the campaign is that it seeks to restore fairness by pressuring the IMF, World Bank, and Interamerican Development Bank to enter into a Payment in Lieu of Taxes (PILOT) agreement with the District of Columbia to make up for their tax-free status. Currently, the three institutions pay no property taxes on the more than one billion dollars of property that they own; they pay no corporate income taxes; and foreign citizens working for the institutions pay no personal income taxes either. The Fifty Years is Enough Network estimates that the combined total of revenue foregone by the District because of the tax free status of the institutions is $1 billion. Earlier, an informal coalition of activists had started and then abandoned the Tax the Bank campaign, and MGJ decided to revive it. The campaign model we chose entailed building a broad, diverse coalition of labor organizations, housing rights groups, women’s groups, environmental justice groups, etc. The level of participation of coalition members in the coalition’s activities would be of their own choosing, with the understanding that many of the organizations were working on other matters of more pressing and immediate importance, like preventing evictions or helping communities cope with immigration raids. The model necessitated extensive outreach and popular education targeted at organizations actively engaged in local struggles, to communicate the relevance and importance of fighting for PILOTs from the International Financial Institutions (IFIs), as well as to communicate an understanding of the imperialist nature of the institutions. The implementation of the campaign, however, ran into some immediate problems. MGJ as a group had built expertise around organizing street demonstrations and direct action, and that is where the collective experience of group members lay. While the organization in theory endorsed the notion of working on Tax the Bank, it soon became clear that there wasn’t a critical mass of members in the group who were comfortable doing the extensive popular education work and (in the later stages of the campaign) legislative work to bring the campaign to fruition. After proceeding for some time with very limited participation by most MGJ members, the campaign fizzled out. The failure of MGJ to successfully work on Tax the Bank points to a major failing of the U.S. global justice movement. The movement has built too much of its history and experience around organizing street protests. The result has been a movement that is episodic rather than sustainable, living from one major action to another while neglecting the required base-building work that needs to happen in between major actions. Even from the narrow perspective of the viability and sustainability of the street protests themselves, this approach has been self-defeating. Another important observation about Tax the Bank, as it applies to the broader question of integrating local and global action by the U.S. global justice movement, is that it is in many ways a unique situation. The tax free status of the IFIs has a direct impact on the city of Washington, DC, by further constricting the resources of an already impoverished and disenfranchised city. This is a rare example of a direct impact of a global institution on local communities. Tax the Bank afforded MGJ with the opportunity to take its understanding of the local impacts of neoliberalism beyond analysis and popular education into action. It is unfortunate that MGJ could not make more of this unique opportunity to engage in local action against a global institution. Other global justice groups in the U.S. may not be in the position to engage in a similar campaign or action. The next major foray by MGJ into linking with a local struggle produced one of the most unusual and important (if small) actions in the history of the organization. In September 2006, while the IMF and World Bank were meeting in Singapore, MGJ linked up with the Committee to Save Franklin Shelter (CSFS), a local homeless shelter residents’ group, for a joint action. The Franklin Shelter is a homeless men’s shelter in downtown Washington, DC, housed in an historic school building. For some time, the city administration has had its eyes on the building, and has made plans to lease it to a developer to turn into a luxury hotel. The original city plan called for leasing it to the developer at $9 per square foot in an area where properties typically leased for about $45 a square foot – an 80% discount. This corrupt plan brought together many elements of neoliberalism. It was a classic form of gentrification, displacing low income (in this case, homeless) people to make room for a more profitable use of the prime downtown real estate, serving wealthy people. It was remarkably similar to the displacement of poor, often indigenous people across the Global South for more “profitable” uses of land such as mining, logging, plantation agriculture, and dams. It was a huge public subsidy to a private interest, on the lines of much of the World Bank’s lending. A coalition came together to organize a Washington, DC demonstration around the IMF/World Bank meeting in Singapore. CSFS was not one of the organizations initially approached to join the coalition, but they came out of their own interest. There is a sizable homeless population in the park outside the lavish headquarters of the IMF and World Bank in Washington, DC. The irony of destitute homeless people congregating outside institutions who claim to solve the problem of world poverty does not escape the homeless individuals, and it is this irony that informed the interest of CSFS in taking action against the IMF and World Bank and linking that action with their own struggle for shelter and dignity. The most positive thing about the demonstration was that, at least temporarily, it had an impact. For at least some time, the city dropped its plan to close the shelter to turn it into a luxury hotel. (Now, unfortunately, the plan has been revived by a new city administration.) While this demonstration was certainly not the only factor behind the city’s decision – the residents of the shelter had been campaigning for months to keep the shelter open as well as to improve services for themselves and for all homeless Washingtonians – the spectacle of homeless people joining up with anti-globalization activists could not but have scared the powers-that-be in the city. Months later, in 2007, Empower DC, a local low-income people’s organization, approached MGJ for help in organizing a joint action with the National Association of HUD Tenants (NAHT). 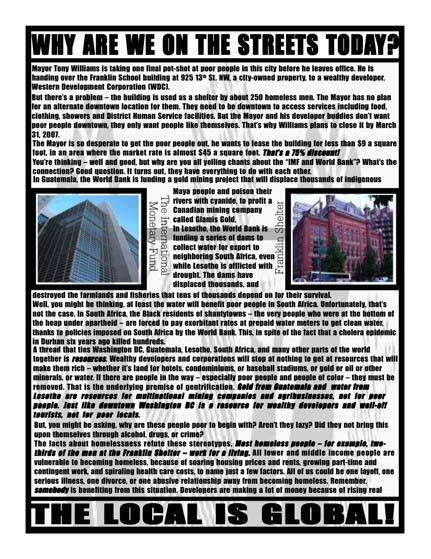 While the Group of 8 wealthy nations (G-8) met in Germany, NAHT and Empower DC planned to target a German bank, Deutsche Bank, for its lending to AIMCO, a Real Estate Investment Trust that was actively taking over public housing nationwide to convert into market-rate housing. Through its lending, Deutsche Bank was financing this process of gentrification. This action provided an opportunity for global justice activists to observe a gathering of global capital – the G-8 meetings – by taking an action that was focused on the impact of global financial capital on low income people right here in the United States. The action achieved its immediate aim of embarrassing Deutsche Bank into agreeing to meet with NAHT. The Franklin Shelter action and the NAHT action on Deutsche Bank are examples of the kind of action, and the kinds of relationships, that global justice activists in the U.S. need to build and participate in on a regular basis if we want our movement to remain viable and relevant. Post U.S. Social Forum, we are in an exciting political moment, with marginalized people’s struggles, from Katrina survivors struggle for the right to return to low income urban communities’ struggle for the Right to the City to Native struggles for land rights to undocumented immigrants’ struggles for dignity, having forged stronger bonds of solidarity and found a new assertiveness. To remain relevant in this political moment, we in the U.S. global justice movement need to shed old ways of doing things and embrace the struggles of the most marginalized people in our own backyards, and not only the struggles of marginalized people halfway across the world. The neoliberal nature of the political and economic restructuring of the United States is becoming clearer by the day. While the economy sinks into a recession, and low to moderate income homebuyers lose their homes to predatory mortgage lenders by the thousands, the government bails out the Bear Stearns of this world – much like the IMF bailing out Wall Street bankers while Korea, Thailand, and Indonesia sunk into a recession in 1997-98. The increasingly regressive tax structure of the U.S. is systematically shifting wealth and income from the majority of the population to a small wealthy minority. The number of workers represented by unions keeps shrinking, as employers mount vicious (often illegal) anti-union campaigns and the government looks the other way. Environmental and consumer safety laws and regulations are being gutted to increase corporate profits. At the local level, cities and towns are being taken over by real estate interests, displacing entire communities to make way for luxury condominiums and hotels. This is why it is imperative for social movements in the U.S. today to place their work in the global context of the neoliberal assault on peoples’ rights everywhere. A clear understanding and articulation of neoliberalism will help weave different struggles together by breaking down the barriers between struggles for housing justice, racial justice, workers’ rights, immigrants’ rights, and so on. Such an understanding will also demystify the motives and interests behind the powers that we fight, sharpening our insight. As we have seen with the experience of the social movements discussed above, an understanding of the global context of neoliberalism can help social movements in the U.S. find allies in similar struggles worldwide. Finally, an understanding of the domestic impact of neoliberalism can help rescue a largely moribund global justice movement in the U.S.
1 The privatization of the water supply was averted in all three of the U.S. cities, but not before a major struggle.